Narcissists have insecure attachment styles that are either avoidant or anxious, or some combination. People with insecure attachment styles feel a basic insecurity stemming from relationships with early caregivers. They doubt the reliability of others to satisfy their emotional needs, and base their self-esteem on the behavior and responses of others. 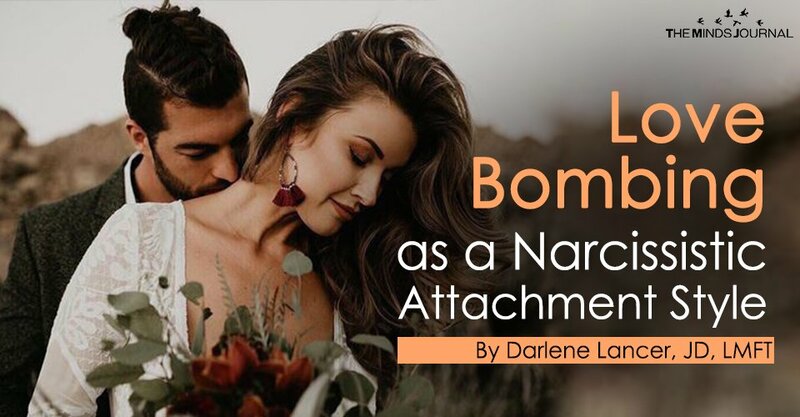 (See “Narcissists are Codependent, too.”) One study showed that people with an insecure attachment style were more likely to engage in love-bombing. When codependents experience love-bombing, their low self-esteem is also raised. They finally feel seen and appreciated, unlike in their childhood. They imagine a future free of their inner emptiness and loneliness with this ideal mate who will always love them. In the initial phase of mutual admiration, they overlook or don’t see differences or potential problems. The good news is that we can change our attachment style. (See “How to Change Your Attachment Style.”) Meanwhile, it’s important to go slow when dating. Rushing intimacy doesn’t rush love, only our attachment. It’s an attempt to gratify personal, psychological needs. It takes time to know someone. That is how trust and love grow in a healthy relationship. Mature daters won’t use undue seduction, charm, or make premature promises and expressions of love. They take time dating in order to assess whether someone will be a good long-term partner, and they won’t want to disappoint or hurt him or her. Stay connected to your body and your feelings. In the intensity of a new romance, question whether your “excitement” isn’t really anxiety about rejection and uncertain hope about a rosy future. Do you feel free to be open and honest and set boundaries or are you walking on eggshells? Are you complying to please your partner? In other words, can you be authentic, say “no,” and express negative feelings? That usually takes time and trust. Often codependents think, “I trust people until they give me the reason not to.” Mature individuals know that trust must be earned. Love bombers lie, but it takes time to figure this out.